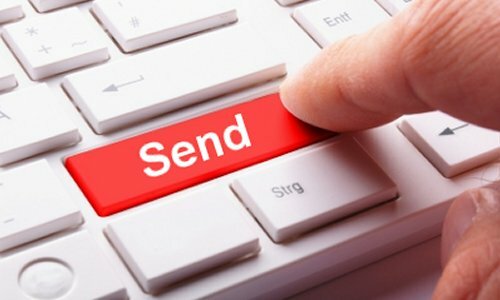 Before you hit “send,” take a moment to write a subject line that accurately describes the content, giving your reader a concrete reason to open your message. A vague or blank subject line is a missed opportunity to inform or persuade your reader. Remember — your message is not the only one in your recipient’s mailbox. A clear subject line will help a busy professional to decide that your email is worthwhile. If you telephoned someone outside your closest circle, someone who probably wouldn’t recognize your voice, you would probably say something like “Hello, Ms. Wordsworth, this is Sally Griffin.” A formal “Dear Ms. Wordsworth” salutation is not necessary for routine workplace communication. When we send text messages to our friends, we expect a lot of back-and-forth. But professionals who use email don’t enjoy getting a cryptic message from an email address they don’t recognize. While a routine email does not require a formal salutation such as “Dear Ms. Wordsworth,” ask yourself whether the person you are writing knows you well enough to recognize your email address. A good motto: praise in public, and criticize in private. Don’t send anything over email that you wouldn’t want posted — with your name attached — in the break room. Email is not secure. Just as random pedestrians could reach into a physical mailbox and intercept envelopes, a curious hacker, a malicious criminal, and your IT department can probably read any and all email messages in your work account. If you stretch the truth in an email (downplaying a problem, leaving out an important detail, etc. ), you’re creating a written record that your recipient can (and will) use to determine whether you are uninformed about the truth you are informed but deliberately misrepresenting the truth your confused and conflicting emails mean you aren’t a reliable source for determining the truth. 4.Distinguish between formal and informal situations. When you are writing to a friend or a close colleague, it is OK to use “smilies” 🙂 , abbreviations (IIRC for “if I recall correctly”, LOL for “laughing out loud,” etc.) and nonstandard punctuation and spelling (like that found in instant messaging or chat rooms). These linguistic shortcuts are generally signs of friendly intimacy, like sharing cold pizza with a family friend. If you tried to share that same cold pizza with a first date, or a visiting dignitary, you would give off the impression that you did not really care about the meeting. By the same token, don’t use informal language when your reader expects a more formal approach. Always know the situation, and write accordingly.